Smarties, I love, love, love this idea! 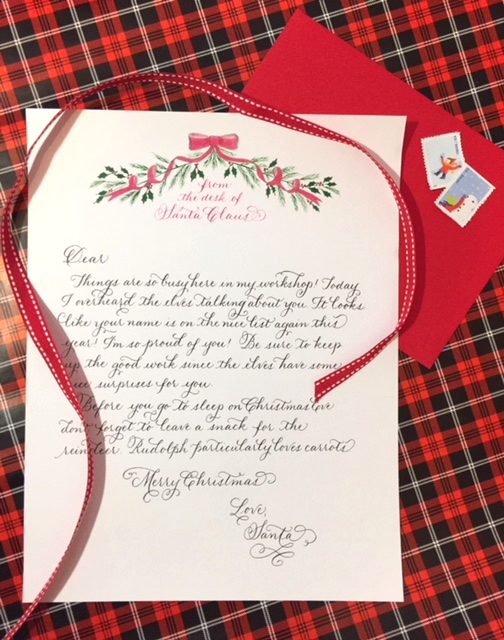 Lori from The Write Occasion Calligraphy has been personalizing letters from Santa Claus for little smarties for five years now. This is her way of spreading holiday happiness and she absolutely loves it (and CSP absolutely loves her)! The letters cost $15.00 ($5.00 from each letter is donated directly to the Levine Children’s Hospital). To order your letter, it is simple, all you need to do is click here. Enter the correct amount for the number of Personalized Letters to Santa Claus that you would like to order, and, in the comments provide the name(s) to whom you would like the letter to be addressed, as well as, the address to where you would like the letter sent. Letters will be sent out within 3 days. Your letter will arrive in a festive holiday envelope (addressed in calligraphy) all ready to be opened by your super excited little smarty! In addition to the monetary donations, The Write Occasion Calligraphy personalizes letters that are delivered to both the Levine Children’s Hospital and The Ronald McDonald House of Charlotte. Smarties, I can hardly wait to see my little smarties faces when they get their letter in the mail. At the same time, I can only imagine the faces of the little smarties that are spending their holiday in a hospital. Such an amazing surprise! Hurry up and order your letter(s), the Last date to order is Saturday, December 16, 2017.